Teodoro Obiang Nguema Mbasogo (born June 5, 1942) has been the President of Equatorial Guinea since 1979. An ethnic Fang, Teodoro Obiang Nguema was born in 1942 in mainland Equatorial Guinea. Obiang joined the military during the colonial period, receiving military training in Spain. After independence he served under Francisco Macías Nguema , first as military governor of Bioko and then as presidential aide-de-camp. He achieved the rank of lieutenant upon the election of Francisco Macías Nguema. 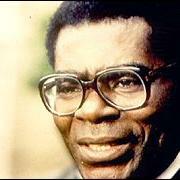 Mr Obiang Nguema overthrew Macías Nguema, in 1979 in a bloody coup d'etat. The former leader was tried and executed. Obiang declared that the new government would make a fresh start from the repressive measures taken by Macias' administration. The new president proclaimed an amnesty for refugees and released some 5,000 political prisoners, but kept the absolute control he had inherited. Officials said President Obiang Nguema won more than 97% of the vote in the country's most-recent presidential elections, in December 2002. Opposition candidates had withdrawn from the poll, citing fraud and irregularities. Obiang's regime retained clear authoritarian characteristics even after other parties were legalized in 1991. Most domestic and international observers consider his regime to be one of the most corrupt, ethnocentric, oppressive and undemocratic states in the world. Equatorial Guinea is now essentially a single-party state, dominated by Obiang's Democratic Party of Equatorial Guinea (PDGE). The constitution grants Obiang wide powers, including the power to rule by decree. Nonetheless, Obiang has far less power than Macias, and for the most part his rule has been considerably milder. Notably, there have been none of the atrocities that characterized the Macías era.